I love innovation. Like most of my engineering peers, I discovered the joy of technology as a child who developed a passion for electronics in second grade. I easily could see the journey ahead, leading me through many inquisitive years at the Don Bosco School in Calcutta, India, to become a Jagadis Bose National Science Talent Search (JBNSTS) Fellow. From there, my journey took me through the Indian Institute of Technology, Kharagpur, for my undergraduate and University of Illinois for graduate school. After over 20 years in rewarding academic posts and 10 years of work in the corporate world, I ultimately came to Schneider Electric. Here, I lead a global R&D organization with over 8,000 team members, five R&D hubs, and a €1.25 billion annual investment. Today, that fascinating spark of innovation is just as strong as it was decades ago when I entered this magical world of making things that have impact and relevance. For we are on an exciting innovation journey as the global specialist in energy management and automation. Most recently, our latest IoT-ready EcoStruxure™ architecture is the crowning achievement of Innovation At Every Level across our four key business markets: building, industry, data center, and grid. But EcoStruxure didn’t just happen in a Schneider Electric vacuum. 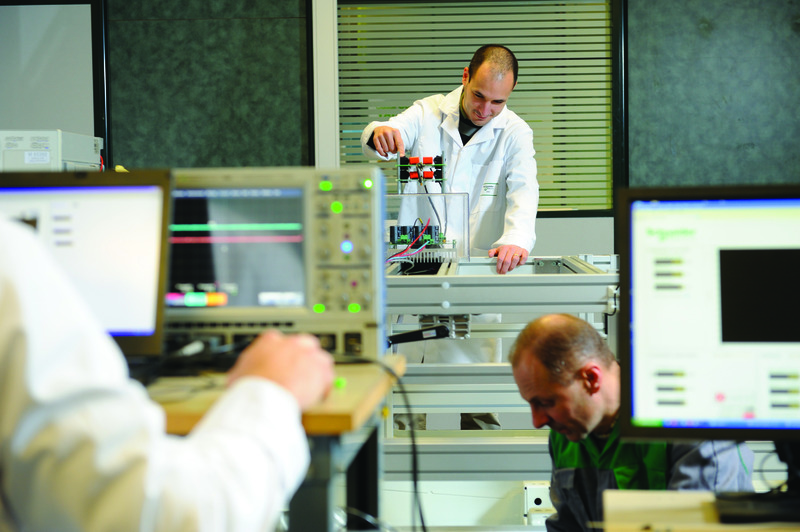 True, our core R&D continues to build on Schneider’s expertise in circuit breakers, UPS, automation and control, and more. But it took a major shift in our R&D thinking and approach to bring to fruition our EcoStruxure architecture and technology platform as a tested and validated, holistic, interoperable system of connected products; edge control technology; and apps, analytics, and services. In short, we had to embrace what was happening outside us and be open to new ideas. We no longer could take a “waterfall” approach to R&D: “If they build it, they will come.” Instead, by bolstering accountability for projects and proactively gaining meaningful customer insights, we vastly improved our R&D footprint and competencies. It’s simple: the world had gone digital, and our R&D efforts had to respond accordingly. In the past our products were 100% hardware. Increasingly, our products have a ratio of hardware and software similar to that of a Tesla car (i.e., 60% hardware, 40% software), so we can borrow concepts from software R&D into our product and solutions R&D. Now, we are using lean and agile approaches in our product and solutions R&D. First we initially build a minimal viable product and test it with customers in key markets. Then we develop future versions by doing software upgrades in the field; these upgrades are based on extensive customer feedback and intimacy. This approach is similar to the way Tesla does software upgrades to its cars. The result? Speed and agility. Through open innovation, we partner with a research ecosystem of startups, universities, partners, suppliers, and even customers; we welcome others to our innovation sandbox, so to speak. Before starting any new R&D project, we ask the question: “Is there any startup anywhere is the world that has developed a related product or technology, and will we be able to partner with that startup to bring our solutions faster to market for our customers?” It is not about the “Not-Invented-Here” (NIH) syndrome. The technologies developed by startups are like individual pearls. As such, our approach to creating new products or solutions is like stringing together a necklace for our customers. Creating pearls takes time, so when they do form, you know you have found a treasure. Likewise, when you look up from watching grains of sand slip through your fingers in a four-walled sandbox, you gain speed, perspective, inspiration, and agility. What did we discover? A broader, expansive innovation playing field that facilitates the capabilities customers need to compete. For Oil & Gas, this means speed and responsiveness, durability and endurance, and visibility and strategy. Intelligence sits on top of all of these. For example, we’re partnering with the startup Virsec to provide integrated cyber security in our Wonderware™ platform. We also are exploring the use of co-R&D with some of our system integrator partners such as Cognizant, Tech Mahindra, Accenture, and Capgemini. For example, we work with Cognizant for co-R&D in the Oil & Gas space. Using this approach, we have half a dozen engineers from Schneider working closely together with half a dozen engineers from a partner on an exciting new R&D problem using lean and agile methods. We call this approach INNOVATING FASTER, CHEAPER, AND BETTER.